On the morning of Friday December 4th, an eight person team of RMRU members left Hemet for Ballarat to join in a joint search effort for evidence of the Germans. Well, in truth it wasn’t quite that simple, because as we were in the process of departing Hemet we were called to perform a rescue of an injured hiker between towers 1 and 2 of the Palm Springs Aerial Tram. However courtesy of some fancy helicopter flying by Riverside Sheriff’s pilots, and a bit of winch work by Lee Arneson and Chad Marler of RMRU, the subject was quickly extricated and Lee and Chad deposited in one of the tram’s parking lots. We loaded them into the van and headed north. We arrived at the command post at Ballarat “campground” just before dark and set up camp. I put the word “campground” in quotes because, …well you would just have to see it to understand. Shortly after dark, wonderful food was rolled out and a briefing was held for all the teams. The big search, being planned and run by the Inyo Sheriff’s Office, was being done as an OES search. “OES” means the California Office of Emergency Services and is a state-coordinated mutual aid arrangement which allows for the bringing in of additional resources, which in this case meant additional search teams. The mission plan was to begin first thing Saturday morning (December 5th) inserting a variety of teams via a pair of borrowed Homeland Security helicopters at three locations, comprising two search areas (Alpha and Bravo). Reportedly, the cost of the helicopter operation was being covered by the German Embassy, but I haven’t verified that. Landing zone (LZ) Bravo was adjacent to the spot the remains were found by Les and I just over three weeks earlier. Teams inserted in this area would be doing a detailed search of the upper alluvial fan and also the canyons running north, eventually moving back down to Anvil Canyon and westerly out to the trailhead at Willow Spring. From there they would be picked up and transported to a secondary command post operating at the Stone Cabin. The other two LZs, Alpha1 and Alpha2, were about 4 miles further to the south of the Bravo LZ. Teams inserted at these locations were to search southerly to the boundary of the China Lake facility, then turn back north and search the three possible southerly routes down from where the remains were found and continue to the Bravo LZ. All teams would camp for the night there, as additional water was being placed at that location. The teams assigned to the Alpha LZs would then exit via the same route Les and I had used, the shortest route at around 11 miles. Radio communication was facilitated by helicopter placement of a radio repeater on the top of Needle Peak. 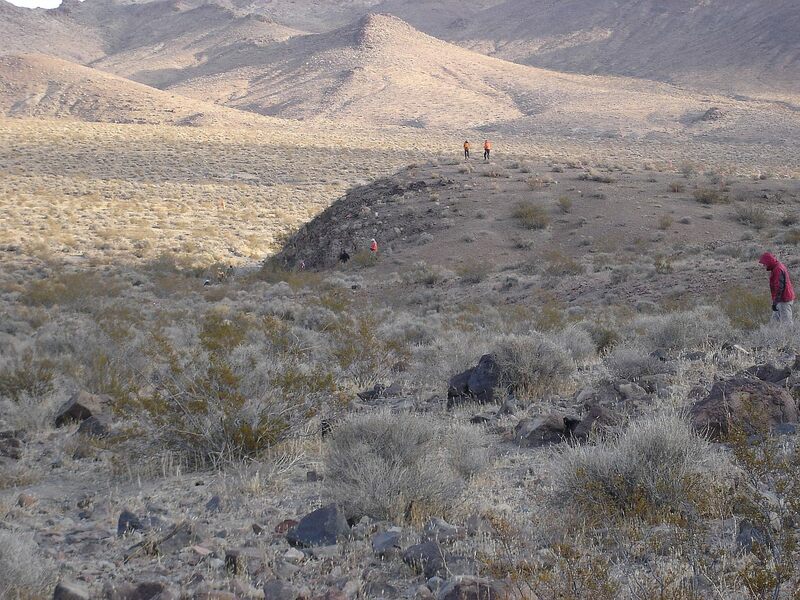 Any evidence found was to be flagged with surveyor’s tape, photographed, marked with GPS and left in place for later retrieval by Inyo Sheriff’s forensic staff. This mission, challenging in itself, had two unusual aspects. First, while we were being inserted by helicopters, we had to walk out on our own. And it was a long walk. 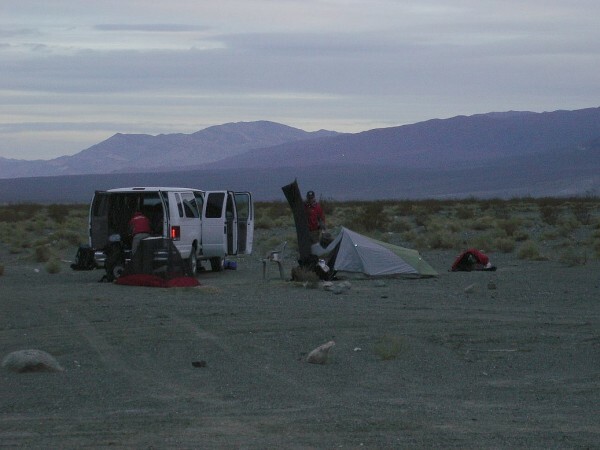 Second, our departure point was on the other side of the Panamint Mountain range from where we arrived with our vehicle, requiring a 120 mile vehicle shuttle. The ground search teams were typically composed of three individuals, however there were also three trained cadaver dogs. The dog teams consisted of a dog, its handler, and a second individual to carry additional water and supplies. In all, about 27 people and three dogs were in the field actively searching, and perhaps another dozen personnel were involved in running the command posts, driving and other support operations. Search teams represented included Inyo SAR, CLMRG, RMRU, San Bernardino Desert Rescue, Calaveras County SAR and DVNP. This was quite an impressive search given the constraints it had to operate under. It was a cold night in Ballarat, but early next morning we were packed and ready to go. I was assigned to the easterly Alpha area LZ, as part of a team consisting of myself and two of my RMRU team mates, Lee Arneson and Pete Carlson. The first helicopter out carried the radio repeater, and the second helicopter carried Lee and Pete (during the first flights of the day the helicopters had extra fuel so their carrying capacity was limited). I went out on the third helicopter flight, along with Les Walker, a dog and his handler. Les and the dog handler were a dog team assigned to operate out of our LZ. After a wild flight down low, through the canyons (Note to readers: If you ever get a chance to fly with US Customs pilots, do it!) we were dropped in a spot that was about as close to the middle of nowhere as I’ve ever been. 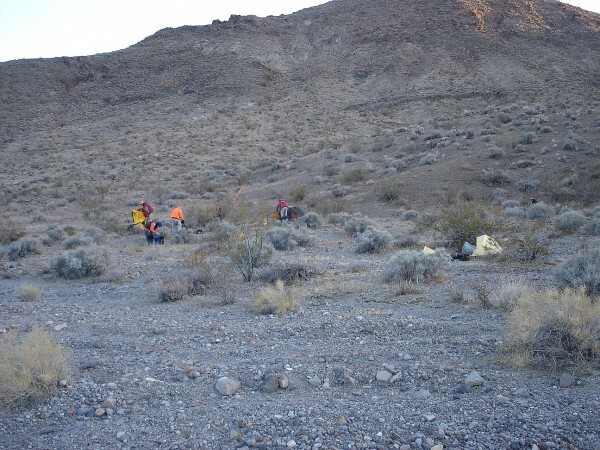 We were only about 1-1/2 miles north of the China Lake military border, so we decided to leave our heavy packs at the LZ, and head south with just the basics to do some searching. I was especially happy to be in this location as the topography seemed to funnel two of the three probable southerly routes into the large wash that lay before us. So Lee, Pete and I went south, and Les and his dog handler went off in whatever direction the dog felt like. After about an hour we reached the China Lake NWC border, seeing nothing other than an intriguing old beer can (which we retrieved as a possible clue). Out there on the vast slope there were no signs to be seen telling us of the China Lake military boundary at our feet, only a line on our GPS displays. We did see an old rock cairn that we suspect was used to mark the boundary of the military base, but there were no fences, no signs, no nuthin’. Not a sign of human imprint anywhere. Further south, I could see the hills of the Epsom Salt Works Jeri and I had been at only a short time earlier. As we looked out over the vast area in front of us, comprising the China Lake property, I was surprised to note it was not possible to see the Wingate Airfield from anywhere along this route. That meant if the Germans had come this way, they would not have seen a single piece of human construction to draw them in a specific direction. They literally could have gone anywhere. And from where we stood, anywhere looked pretty damn large. Seeing nothing, we turned back north and reluctantly started the long uphill climb back to our packs and on to the planned camp at the Bravo LZ. Our task along the way was to search the easterly drainage of the upper alluvial area, what I had labeled S3. Almost the entire upper area drained down through the very large wash we were travelling up. If there were any clues to be found here, it was likely they would have been churned to oblivion. We arrived at the Bravo LZ at 4:00 PM, just as it was starting to get rather cold. We knew that there was a major winter storm forecast to hit the area in a few more days, but it seemed like the temperature was dropping well in advance. It was good to see all the others at the camp, as we had been on our own most of the day. It was even better to see the pallet of water and energy drinks! As a point of reference, my team mate, Pete Carlson, an adventurer and climber all his life, has traveled to exotic places all over the world. As we were out there, he remarked to me, “This is the most remote place I’ve ever been”. That pretty much sums it up! Before it got dark a few of us had a quick look around to see what had changed at the site since Les and I had last been there. It seemed like whoever had been there after us to collect evidence had done a good job, as there was little to be found. I say “seemed” because as we looked a little closer, we suddenly noted a number of other scattered skeletal pieces on the cliff and off to the side. Clearly there was more here. At the team’s briefing that evening at the Bravo LZ, it was decided all the team members present at the Bravo LZ would take a couple of hours in the morning to scour the immediate area and hillside before departing the area around 9:30 or 10 PM. We knew we had an 11 mile trek out, so we didn’t want to linger too long. That night was an amazingly cold night. This being Death Valley, many of us brought “summer bags”, sleeping bags comfortable down to perhaps 30˚. Combined with the shelter of a tent, that should have kept us reasonably comfortable. I say “should have”, because it most certainly didn’t. Personally, I spent a cold and wretched night thinking about the new tent I needed to buy. The next morning, Sunday December 6th, someone with a thermometer reported it was 19˚! As we poured water from the cache into our pack’s water bladders, it started flash freezing and turned to slush before our eyes. Great way to start the day! The cold temps made the heat-generating act of walking around the hillside quite pleasant and welcome. Beyond that, it was very useful, as numerous additional remains were found and marked. I was a little chagrined, as I had passed through this very area as I hurried down from the saddle to connect back with Les after he found the site. A good example of tunnel vision. Anyway, the hillside was now ablaze in fluorescent red tape streamers. As I looked across the hillside and saw all the orange shirts methodically moving across it, I felt a huge sense of satisfaction for two reasons. First, I think the Germans’ families would be touched to see all the interest in their missing relatives even after all these years. The people out here had all displayed intense dedication to find and bring the Germans back. And second, some of those folks on the hill were on the original search and it was closure for them too. Finally, it was nearing 10 AM and it was time to depart. We were warned via radio that the storm had moved up and was now expected to hit that night, so we were all maybe a bit more eager than usual to leave. Some of the Bravo teams had already left, heading due north to Anvil Canyon, before turning westerly to exit. They would be checking a couple of canyons on the way. 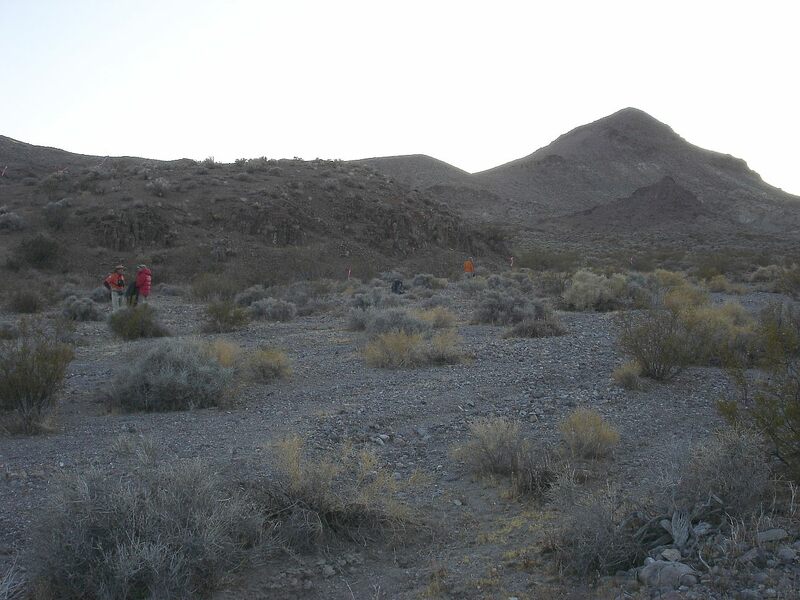 The rest of us, mostly from the Alpha area LZs, were taking a more direct route and headed up and across the alluvial fan to the northwest, to where Les and I had camped earlier. From there we dropped into the canyon that would take us most of the way towards Anvil Canyon. But to save distance, before we reached Anvil Canyon we veered off to the left, and headed cross country until we dropped into Anvil Canyon at a point almost were the van had been located. Lee, Pete, Les and I seemed to be toward the front of the groups, and reached the head of the canyon as the winds started to pick up to gale force. Wonderfully for us, there was a 4wd waiting to take us to the command post at the Stone Cabin. Reaching the cabin, we found food, hot drinks and Deputy Winkler, probably in that order of importance! The Inyo Sheriff’s Office had a fantastic setup going there which was welcomed immensely by all those coming out of the cold. Following a debriefing, and dumping of GPS logs and camera memories, we were cleared to leave. Well…That’s the way it was supposed to have worked. The RMRU team vehicle was a 2wd van that could only make it as far in as Warm Spring, which is where it was left. I caught the first shuttle back down the 12 miles or so to the van, along with a number of packs, to prepare for departure. After about an hour and a half, I saw lights coming and it was the rest of the RMRU team in shuttles and knew it was time to leave. Uh, not exactly. They informed me that we would have to wait a while longer, as Les was out on a rescue. Huh? Rescue? It turned out one of the Bravo teams, a team of four, had one of their members suddenly fall ill in the field, possibly the flu, and were moving slowly. They reported to the command post that they were about a mile from the trail head, and could use some help carrying the gear of the sick individual that last mile out. So Les and Lee of RMRU volunteered to drive with a ranger down to the trailhead, hike in to the team and help carry out the gear. But by the time they reached the trailhead at Anvil Canyon, it was becoming obvious something was wrong with the team’s reported position. 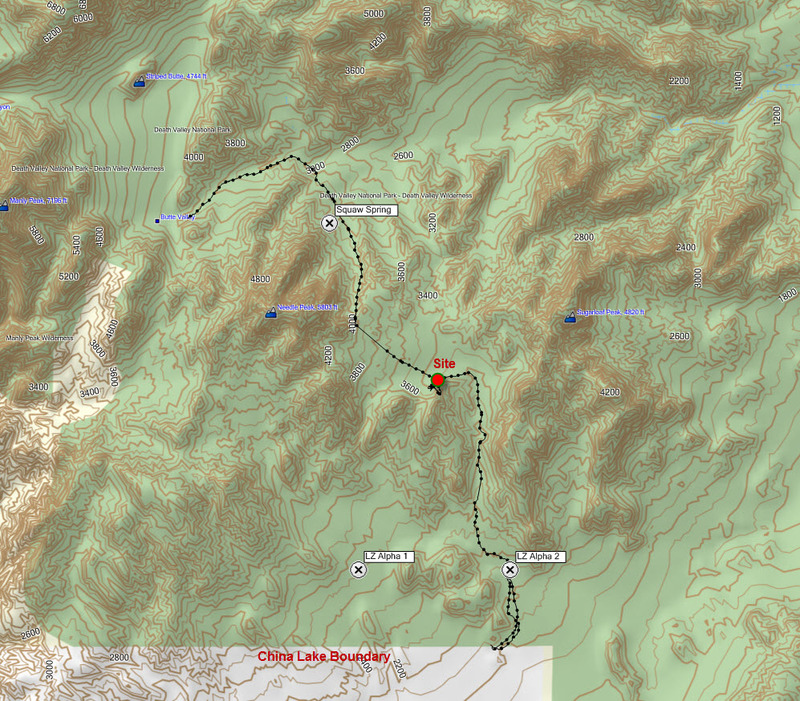 An exchange of GPS coordinates revealed the truth…..They were about six miles down Anvil Canyon from the trailhead, and headed in the wrong direction. This was now a potentially serious situation. It was dark, with the storm coming in, and the team had to be extracted ASAP. But with one very sick individual, they wouldn’t be able to cover that amount of distance after an already long day. The ranger, who was driving a military style Humvee, received special permission from DVNP HQ to enter the wilderness in the vehicle, travel down Anvil Canyon, and extract the team. Les had gone along since he was very familiar with those areas of the canyon, as well as having the GPS tracks. So finally after another hour and a half, Les arrived at the RMRU van with the ranger with a good rescue accomplished. For RMRU the DV search was nicely bookended between two other rescue missions. It was a long drive home, and we didn’t reach our Hemet base until 12:30 AM Monday morning, after which we unpacked and headed off our respective ways. 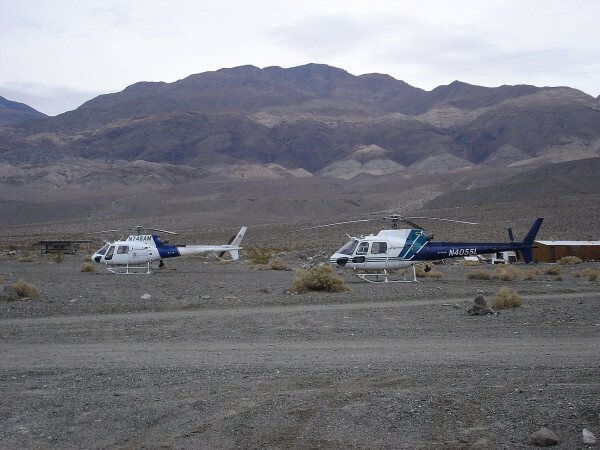 It had been the plan of the Inyo Sheriff’s Office to send a helicopter in the next day to extract the additional remains and evidence we had found and marked so well. But the intense storm coming in was expected to dump snow on the area, making retrieval impossible for perhaps a week. Because all this well marked material would be sitting there unprotected in the interim, the Sheriff strongly urged all of us to keep all of the weekend’s events as confidential as possible until they could retrieve the material. Considering the buzz over the case and the discussions happening on various Internet forums, it seemed like more than a reasonable request and we were all happy to comply. It turned out the forensics people weren’t able to get back to the site until December 29th, so keeping a lid on the information turned out to be a very good idea. On March 8, 2010, the Sierra Wave news outlet in Bishop reported that the Inyo Sheriff’s Office had so far failed to positively ID the remains recovered. Weather exposure had deteriorated them to the extent no viable DNA could be recovered. Forensically all that could be said was that the remains included the bones on an adult male and an adult female. No conclusive evidence of the children had been found and that more searching would be required.